The Master Bedroom currently contains all of the modern things that complete a historic home. In honor of Dallas Heritage Village’s 50th anniversary, a new exhibit in their signature home, Millermore, shows visitors how historic house exhibits are created. My younger self was belly down on the antique rug, stretching to extend the vacuum hose under a bed and eradicate an extensive spider colony. Fifteen years ago my belly was much flatter and my job at Dallas Heritage Village was cleaning the exhibit buildings. I got to know the period room displays very well, every knick-knack, every dust catcher, every old stain. I noticed a certain degree of repetition. In 2001, Dallas Heritage Village had 21 fully made beds on display. 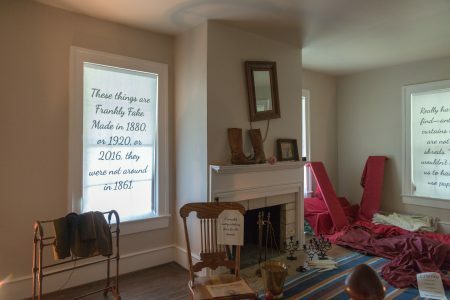 In 2015, Dallas Heritage Village still had 21 fully made beds on display. As of September 1, we are down to 15 and if Goldilocks is sleepy she need not bother to visit Millermore because none of them are there. In August, me and my merry band of exhausted furniture movers changed everything in Millermore. The last time Millermore changed much was when it moved to our site in 1969, when I was 6 years old. I am now 53 and find vacuuming while prone increasingly difficult, because things change with the passage of time. Even history changes. We learn new facts, think about them differently, and ask questions people didn’t ask when Millermore first opened its doors to the public. 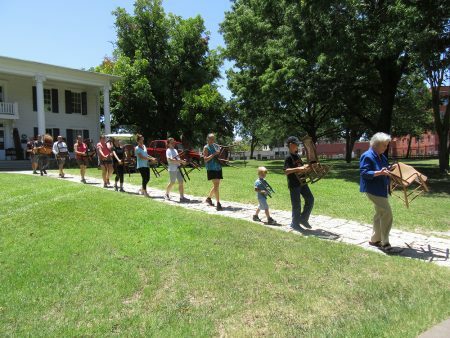 A parade of chairs exits Millermore. The parade is led by Lynn Vogt, granddaughter of DHV’s founder and the children of staff members. So right now (until the end of July), Millermore is a mess, a careful, artful mess of which I am quite proud. Instead of showing what Millermore looked like in 1861, it now shows how a curator would go about making it look like it did in 1861. 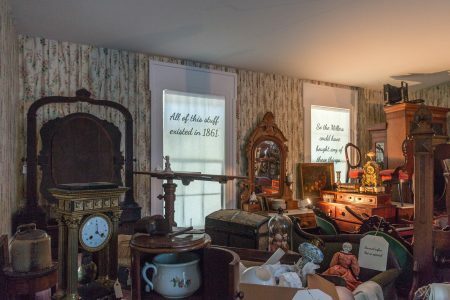 Different rooms show the resources available for that project, including actual Miller possessions, assorted reproductions, and a giant pile of non-Miller owned antiques without which the museum house could never have been furnished. I have recorded the curator’s thoughts on notes in the windows and tags on the furniture. If you ever assumed being a curator is a lofty intellectual and artistic profession filled with great thoughts, you may need to change your mind. Speaking of your mind, Millermore wants you to exercise it, maybe even strain a muscle, to see a new side of the house. If a future historian visited your home to learn about our time, the lesson would be different with each visit. One day your family is intrigued by news of national importance entering your world by various twenty-first-century media. The next you are constructing a giant homecoming mum and trolling the internet for the best deal on electric service. A family member could be observed experiencing our lack of cure for the common cold, while an eighteen year old son is off to register for selective service. And for no logical reason Fido is wearing a rhinestone collar and a plumed hat. The formal parlor is currently full of all the period pieces that make up the majority of the contents of the house. If your house can be a multifaceted and ever-changing exhibit space, Millermore can change its message at least once. Millermore and I have both grown up enough now to see that we should be bold. So our current exhibit, “Millermore Exposed,” not only sounds slightly dirty but is different than what was there, and I make no limiting promises about what will appear there in the future. Or what you may see in Sullivan, or the bank, or that purple house that we currently call the Blum house but there were never any Blums so we are going to call it something else. Dallas Heritage Village is a museum about history, not an unchanging snapshot of one moment in history. Our visitors can handle more than one lesson at the Village. In fact, they might prefer some surprises. 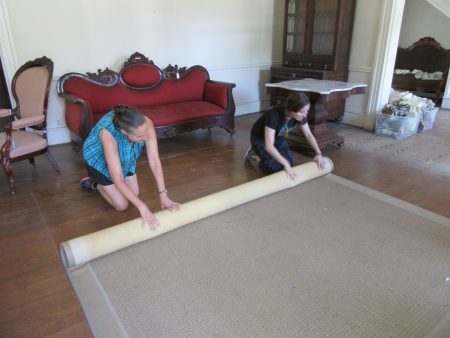 Evelyn (left) and Mandy roll up one of the carpets as DHV staff empty Millermore in preparation for a fresh coat of paint. Want to write for AASLH? Learn more and submit an article here.